The Vegan Month of Food is flying by this year. It has really been nice having it a month earlier than the past two years and having the opportunity to prepare more summery dishes. It especially worked for my theme, Dad Say’s It’s Toxic. I know people do raw year round, it just seems the perfect cuisine for hot weather. Okay, so prior to the chickpeas I had never sprouted and had no idea how much they would grow. I sprouted entirely too many. While I tried to figure out what to do with them I remembered that once many years ago I had tried a salad at a Mediterranean restaurant that I really enjoyed made of chickpeas and green beans. 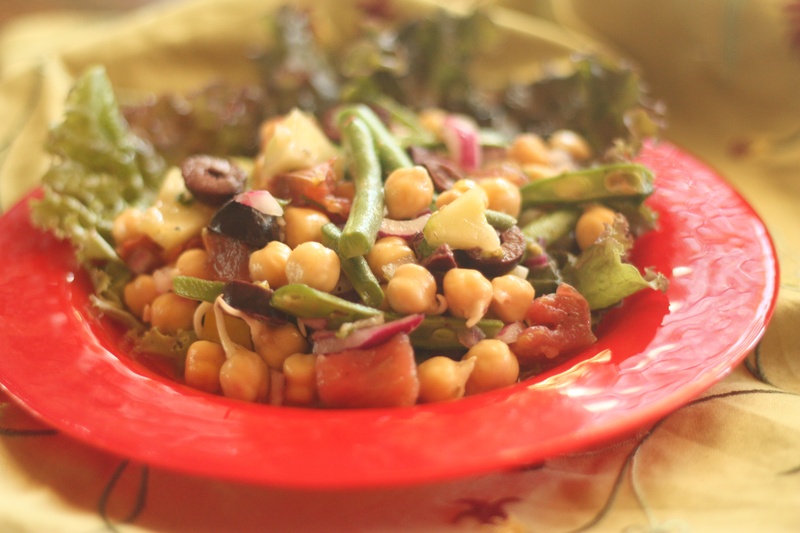 This salad would be perfect because we had green beans that needed to be used. It had been a long while since tasting it and I didn’t know the name of the dish to look up a recipe, but I knew it had a vinegar base blended with a citrus flavor. I distinctly remember the parsley because years ago this was not my favorite flavor and I was really fearful that it was going to ruin the salad for me. I also remembered that it had cucumber that made it really refreshing. In the original salad, the green beans had been slightly steamed. I decided to keep them raw. This salad came out delicious and paired well with the Chunky Gazpacho Soup. Dad was thankful to have such a refreshing lunch on a hot day. By the way, sprouted beans are my new favorite thing. They are a taste sensation that is completely new to my palate. I am not so sure my mom likes them. I will say right now that I am not sure if olives are raw but Dad does not find them toxic so I used them. Put all ingredients from chickpeas to parsley in a large bowl. In a separate bowl mix dressing ingredients. Pour dressing over other ingredients and mix well. May be served immediately. Have you checked out the list of the other amazing bloggers participating in the Vegan MOFO? The BlogRoll is here. Gallery | This entry was posted in MOFO 2013: Dad Says It's Toxic, Salad. Bookmark the permalink.